The volleyball team has risen to No. 4 in the NJCAA Division II rankings with an undefeated streak in conference play. The Raiders, who were ranked 8th in the preseason poll, swept Ancilla College 3-0 — 25-17, 25-17 and 25-23 — in front of their home crowd on Sept. 6. They moved to 7-1 on the season, and 4-0 in conference play. GRCC will face off against Ancilla College again in Donaldson, Ind., on Oct. 9. 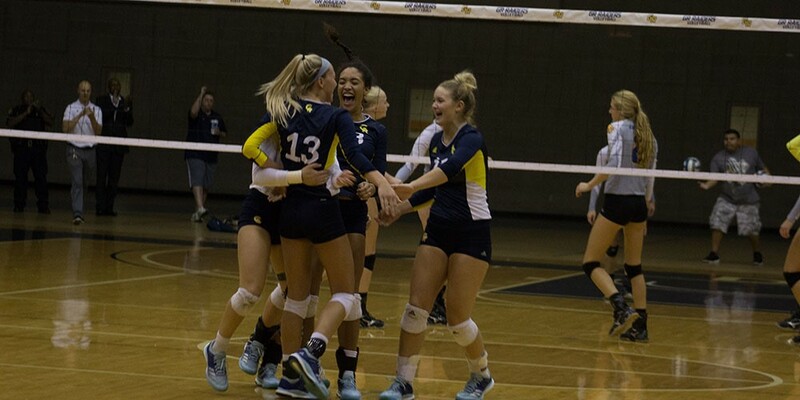 Last week, GRCC recorded 47 total kills, 57 digs and 8 blocks, with the most impressive number being the team hitting percentage of .313 — a season best thus far. Leading the way was sophomore Kendra DeJonge, who racked up 11 kills, picked up 5 digs and a block during the match. Both Ally German and Lauren Jonker had strong play at the net, where they each recorded 9 kills apiece and hit over .400. Freshman setter Jamie Wellet led the way for the Raiders, as she racked up 22 assists and picked up 6 digs as well as a service ace. Freshman libero Jasmine Wellet recorded a career high of 12 digs and also picked up a service ace. The Raiders are back in action today as they travel to Kellogg Community College. They play Jackson Community College at 6:30 p.m. Sept. 13 at Northview High School, 4451 Hunsberger Ave. NE. GRCC’s home games are being played at Northview while Ford Fieldhouse is being renovated.